Did you hear the “pop”? That was us celebrating the arrival of the world’s first free e-procurement system. We’ve tried to predict your questions and we put that knowledge into the online help system and the first round of tutorial videos. But we aren’t expecting to hit a home run right out of the gate, so please send us your feedback and let us know what else we can do to help. And don’t forget to sign up for this Blog. As we add to the software and our library of tutorials or other resources, we’ll be making blog posts to let you know that there’s something new to help. If you don’t follow the blog, you won’t find out about the new stuff. 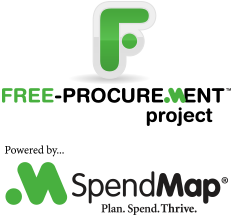 Thanks again for trying the free version of SpendMap!